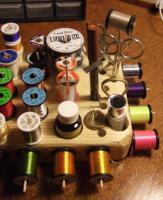 Last week I went along to the Milngavie fly tying club with the old Glasgow fishing buddies. A really excellent angler called Neil Sinclair was demonstrating. Turns out he’s also a terrifically nice chap, which is always a bit grand. Emanuelle, a pal rumoured to be among the finest of Italy’s fly fisherman and a known catcher of big fish, leant forward at the start and whispered in my ear: ” you know, they call him the ‘trout machine’ “. Enough said, the man obviously had class. It turned out he also has brains. Neil had tackled the problem of tying tool organisation with the help of TK Maxx’s finest cutlery stand. 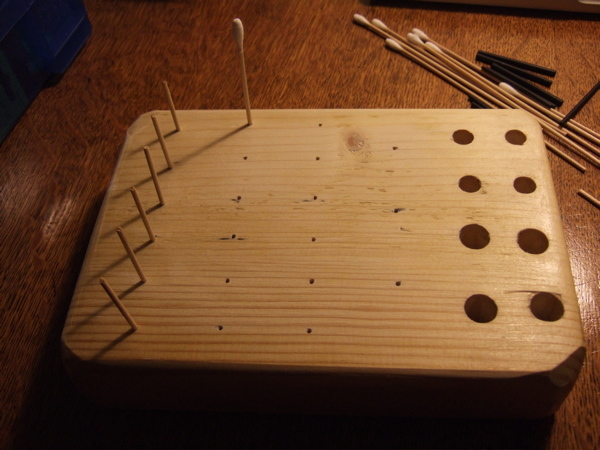 This was a device consisting of wood and holes. Tools go in holes, tools make easy find, angler find self happy man. A little spark flashed in my brain. This could go further. With a little sprinkling of the Magic Powder of Flyfishing and some of the most supreme DIY skills known to man I felt I could be on to something. One of the most important perks of working at a large university is the access to a workshop. Normally this is used for endlessly pursuing the frontiers of science and progress, but occasionally a more important project passes through the doors. I hunted around for scrap wood. A piece about three inches thick caught my eye. It was rough around the edges, and had some nails in it. Perfecto. A quick word with a technician and it was cut to the right size. Next, some quality time with a belt sander. The roughness melted away and a piece of pure beauty began to materialise. The grain of the wood, notches, scarring and all looked at me and spoke of simpler times. Times when all a man needed for a bit of satisfaction was a nice chunk of tree. I began to feel excited. The drill was next. A variety of holes were carefully made. 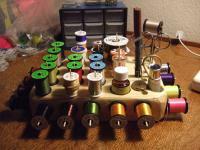 The small ones were positioned on the left side and sized to perfectly fit advanced bobbin holding devices. These were small bits of wood ingeniously sourced from cotton wool bud handles. 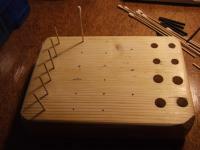 Larger holes for the tools were positioned on the right side, including one especially large one for the head cement and one for the deer hair stacker. Scissors, dubbing brush (also home made) and bobbin holder were coming home. I felt their excitement and it doubled mine to a dangerously high level. The Piece of Pure Beauty was coming close to completion. All she needed was some sanding sealer and a quick sand down with fine glass paper and she’d present a silky smooth finish to the world. Oh, a name was needed as well. The Stand of Majesty seemed appropriate, I’m sure you’d agree. I rushed home tonight to put everything together. Sure enough the Advanced Bobbin Holding Devices fitted snugly into their holes. Placing the first spool of thread onto the bottom left Holding Device was a watershed moment. This was going to be more than good. Epic, magnificent, Majestic. You simply can’t buy this kind of thrill. The tools made their way back home, fitting perfectly. The head cement, the hair stacker, the scissors and even the dark brown marker. It all fitted snugly. By this stage a grin of similarly epic proportions had made its way onto my face. I haven’t felt this satisfied for a long time. 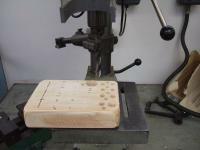 It’s something to do with the wood, the hand worked tools and the bodged on-the-fly design process. The cost, eh, that would be zero pounds and zero pence, is also rather nice. Most of all though I think it’s the time. Not a lot, but enough to think about things. 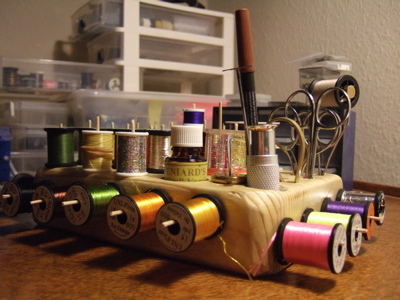 Slowing down, using your hands and turning a piece of tree into something useful for fishing. Heaven knows what it’s like to build your own bamboo fishing rod. Must be pretty damn orgasmic. I’m a long way off that, but this wee project has helped me taste a little of the pride and satisfaction that life long wood workers must know. 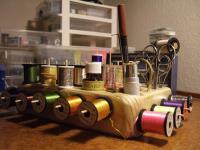 So I’ve now got the most organised fly tying bench in Scotland. She looks like a cross between a space ship and a fishing tackle shop. Thread, tinsel and ribbing are all at a finger’s distance from the vice. I hope she will help me to stay more sane in the long term, and perhaps become a more efficient fly tier. Whatever happens, it’s been already been worth it. I think you have demonstrated well what separates us from the animals, namely the ability to use our hands to create. Nice craftsmanship, Mike- very well done! anonymous: we are closer to our hairy relatives than you think. Bonobo apes and other primates have been making and using tools for longer than us humans have existed. Fundamentally, perhaps controversially, but ultimately irefutible is the fact that the only significant difference between us and the beasts is staring you right in the face: the written word. The written word gives us the power to document, to record, to pass information between generations. But even the most skilled monkey in the World couldn’t compete with The Stand of Majesty. Thanks very much folks 🙂 I think I’m going to stuff the day job and market this commercially. Supposedly we ARE actually quite different from the apes. There is a term, I forget what it is but it relates to the ability of humans to touch each of their fingers to their thumb, in quick succession. Apparently humans are the only species that can do this. It is meant to be the source of our amazing ability to create and use machines. I’d love to know if I was wrong, though! I never said that we are not similar to apes; of course we are. and so forth; even the Stand of Majesty. In fact, you confirmed exactly what I said: no monkey could create such a thing. Thus, the difference between us and apes is exposed. Of course we are similar in other ways. My brother farts like an ape. Dexterity is the word you are looking for, Mr anonymous! They don’t even have hands, yet they can create a differential pressure regulator capable of curtailing one of nature’s strongest forces – running water. And what about termites who engineer passive ventilation strategies into their homes, by utilising the buoyancy effect of warm air to draw in cooler air into the base of the mound? Animals were making machines long before we were, my friend. What makes us special is our bizzare fascination for quantifying our environment. For example, who decided that the passing of time should be sub-divided as it is? Who called it time anyway? Was a mile a mile before the first human walked his first mile? How was all this new information remembered? We are scientists, and it’s our ability to communicate with each other that gives us these powers. i’ve seen one use a flower to get the fish to rise.